While my mother’s parents were from Sicily, it was not until recently I learned of La Befana, Italy’s oldest and most celebrated legend – about a witch. In Italian folklore, she is an old woman with warts on her crooked nose, wearing a skirt and a black shawl, who flies around on her broom, delivering candy to well-behaved children. In Russia she is known as Baboushka. Children await Babbo Natale on Christmas Eve, but the red-suited man is new compared to the story of the old woman who was too busy cleaning to join the Wise Men on their journey. According to the legend, they stopped by her cottage to ask directions and invited her to come along, but she refused. She also refused to join a shepherd who asked her to join him, as some tell the story. Later that night she saw a great light in the sky. Regretting her decision, she sets out to give the Christ Child gifts that had, according to some, belonged to her child who had died. She never finds the Baby Jesus and instead, leaves her gifts for children she encountered along the way. Since the 13th century, children have left their shoes out or hung up their socks Epiphany Eve, January 5, for the Befana to fill with sweets and gifts. Bad children were given lumps of coal. Often she is shown covered in soot because, like Santa Claus, she delivers presents by sliding down the chimney. Her name means “gift-bringer” and according to a post by DreamDiscoverItalia.com in 2015, many believe she also sweeps the floor before she leaves, sweeping away the old to make way for the new. La Befana is a Christian legend that began in Northern Italy and became a big part of the Italian celebration of the Feast of the Epiphany, which commemorates the 12th day of Christmas when the Wise Men arrive in Bethlehem and deliver their gifts of gold, frankincense and myrrh. Other versions of the legend have La Befana carrying a sack of bread, giving a piece to every child she saw in the hopes one would be the Christ Child. She never does find him and is still wandering around Italy on her broomstick. Her arrival is celebrated with such traditional Italian foods such as panettone, fried doughnuts with dried fruit, and fritters with raisins. When children leave a snack for the witch, it’s something soft because she has few teeth. While La Bafana is viewed most commonly as a village crone, she has also been called a sprite or fairy. Instead of a broomstick, sometimes she is said to ride a goat or a donkey. Rarely does she wear a pointed hat; a headscarf is more traditional. Heather Greene explains in an article for “The Wild Hunt” in January 2016, “As with many regional traditions, La Befana’s modern construction and appearance were developed over an expansive amount of time and stem from a diverse number of cultural elements. Her story has been adapted over and over to fit into a variety of different social or religious structures. Urbania, thought to be her official home, draws tens of thousands of people for a five-day festival that includes the arrival of La Befana to her cottage, which the townspeople built in her honor. There is music, dancing, parades, fireworks and letters from children asking for gifts. In Venice, men dressed as La Befana race boats on the Grand Canal, per DreamDiscoverItalia. In Rome and elsewhere, women dress like La Befana. With this simple spell you can ask The Befana not only to bring your home prosperity, but also to send you powerful energy regarding your success and the goals you will work with next year. In the evening, put the three figs or dates in the small cup of honey (this is a traditional offering for The Befana) and put them on the table or the altar next to the red candle. These offerings will show that you honor her powers. “Come Befana, come to me. Come from the mountains to make me free. Once you have repeated this spell three times, take the broom and start sweeping the room in the direction of the clock’s hands, always sweeping towards the central part to concentrate there the powers and the charitable energy of The Befana in one place. The next day, pick up the broom, clean up the dust and debris, and focus on a hugely prosperous year. This year, in honor of my ancestors, I plan to recognize the Witch of Christmas for making winter a witchy season. Perhaps I’ll dress like her, or leave my shoes and a soft cookie outside my door. If you celebrate her, please leave me a comment describing how on the Pagan Pages Emag Facebook page. Besoms – along with black pointy hats and cauldrons – are the three symbols most associated with witches. That was part of the reason my coven decided to have some fun with them. One full moon we adorned black hats. On another, we decorated brooms. The idea was to personalize it while incorporating all our energies. We each began with a standard broom, a crystal, and ribbons and beads for the directions, the God and Goddess. We then exchanged offerings. 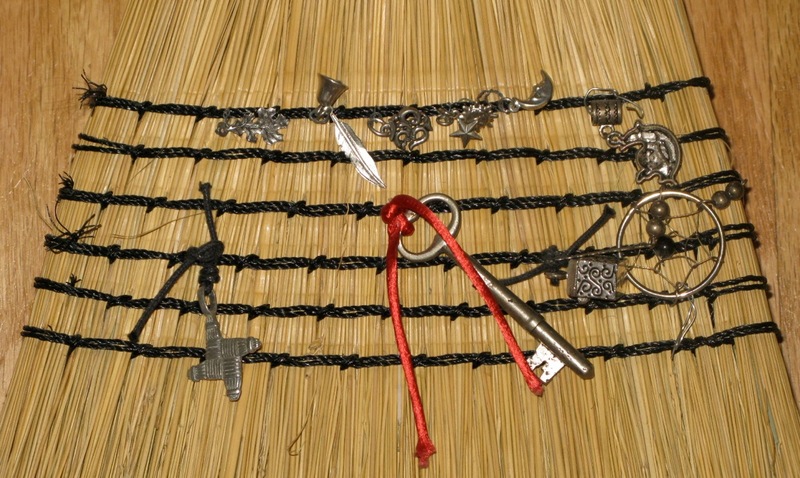 I gave everyone shells and a skeleton key. Each woman chose how to incorporate the items into her broom, so no two were alike, yet each had all the same components. We used our besoms in ritual, to cleanse a space and to define our circle. Other items were added along the way. After a while, we stopped lugging them to ritual. They were retired after there had been a significant turnover in the coven and together we each decorated a smaller broom, transferring some of the unique items. It wasn’t long before we also stopped carrying those new, smaller brooms to ritual, and again, there has been significant turnover in the coven, but, as of yet, no talk of brooms. If this has inspired you, let me point out one thing to keep in mind. Generally, I had stored besoms with the handle down and the bristles up. 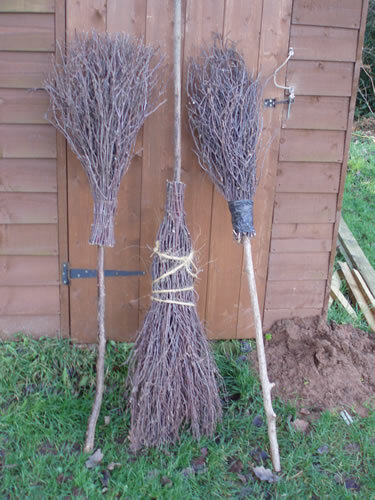 But decorations – such as ribbons – seem to naturally hang down to be in place when the besom is held and used to sweep. Storing it upside down then seems to go against the flow of the decorations, so I’ve hung mine off the floor. If you find a way to bring harmony to this predicament, please do post to the comment section! You will need: 4ft dowel- 1″ in diameter or a tree branch of the same approximate size, ball of twine, scissors, straw, thin willow twigs, broom corn or pliable herb stock. Take the straw or other herb stalk that you have chosen and soak overnight in luke warm salted water. The water swells the stalk slightly for bending without breakage, and the salt dispels former energies. When ready, remove stalks from the water and dry for just a bit. Not too much or the stalk will stiffen up, again. Place the dowel on a table where you have room to work. Start lining the stalks along the dowel , about 3 inches from the bottom, moving backwards. Begin binding the stalks to the dowel with the twine. Tie very securely. You may add as many layers as you like, depending on how full you want the Besom to be. When stalks are secure, gently bend the top stalks down over the binding. When all have been bent over, secure the stalks again with more twine a couple of inches under the first binding. Allow to air dry for a day or two. The dowel can then be stained, painted, or carved into to make personal. Remember to concentrate and charge at the next full moon. Thread the beads onto the pin head wire in this order: small bead, oblong bead, small bead. With the clippers, clip off remaining wire, leaving approx. 3/4″ remaining. Using the needle nose pliers, bend the wire holding the beads into a ring and clamp. Open a link on one end of your chain, and thread through the loop you just made. Clamp shut using the pliers. Open the link on the opposite end of your chain, loop through the pendant. Clamp shut. To use the Pendulum, hold the pendant in your hand loosely, elbow on the table, letting the pendulum swing free. Still the movements of the pendulum with your other hand. Ask the pendulum to show you “yes” – the pendulum should start to move in a pattern, usually in a circle or back or forth. If you can’t really tell, ask the pendulum to be more precise. Once a pattern is established, this is the Pendulum’s “yes.” Now, ask the pendulum to show you “no.” Keep your pendulum in a safe place, and it will treat you well! the meal is eaten in silence so the spirits are not frightened away. as a promise for spring, a secret the earth will keep for you in the cold. Infuse it with all your thoughts of spring and warmth. for winter. At home, prepare for winter in your own way. Try making skull-shaped popcorn balls.